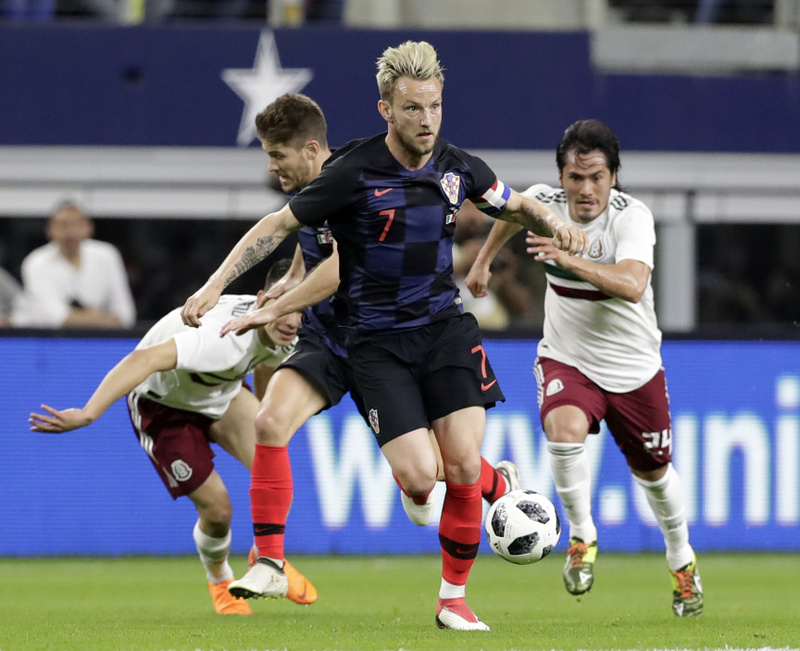 ARLINGTON, Texas (AP) — Ivan Rakitic scored on a penalty kick in the second half, lifting depleted Croatia to a 1-0 win over Mexico on Tuesday night. The penalty was called after Mexico defender Miguel Layun, a halftime substitute, kicked Croatia's Tin Jedvaj on the upper thigh in the 61st minute in the corner of the box. Rakitic's penalty kick, low and to the left, just beat goalkeeper Guillermo Ochoa. It was the first goal given up by Mexico in 350 minutes, including games against Poland, Bosnia and Iceland. Mexico nearly answered five minutes later with a direct kick just outside the box, but Croatia's defensive wall deflected the shot out of bounds. "Tonight we played very well, very aggressive and with good defense," Croatia coach Zlatko Dalic said. "We had lots of chances but scored only once. I knew this would be a tough game, but I am very happy for my team tonight." Mexico suffered a setback in the first half when defender Nestor Araujo was taken to a hospital after sustaining a left knee injury in the 14th minute. Araujo landed hard on the ground while trying to stop a shot on goal from Croatia's Ante Rebic. Araujo was replaced by Diego Reyes. Ochoa and forwards Hirving Lozano and Javier Hernandez all started for El Tri after sitting out a 3-0 win Friday against Iceland. Before the game, Mexico coach Juan Carlos Osorio criticized Croatia's decision to release six of its top players: Luka Modric (Real Madrid), Mario Mandzukic (Juventus), Ivan Perisic (Inter Milan), Marcelo Brozovic (Inter Milan), Danijel Subasic (Monaco) and Nikola Kalinic (AC Milan). Real Madrid coach Zinedine Zidane had requested Modric return to the club, while the other players suffered bruises or minor injuries during Croatia's 2-0 loss to Peru on Friday in Miami. Their absence left Croatia at far less than full strength and deprived Mexico of a tougher test in the last game before its final World Cup roster is announced. "I wanted to see all my players," Dalic said. "My young players gave me good answers. These players showed me what I want — aggressive football, compact football." The two teams last met in May 2017 in Los Angeles, a 2-1 Croatia win. In the group stage at the 2014 World Cup, Mexico beat the Croatians 3-1. Entering the game, Mexico was unbeaten in six matches in front of friendly crowds at AT&T Stadium. The only time the squad hadn't won here was a 2-2 draw with Argentina in 2015.